Whether you’re new to the field or looking to take a step up in your career, Dataquest can teach you the data skills you’ll need. 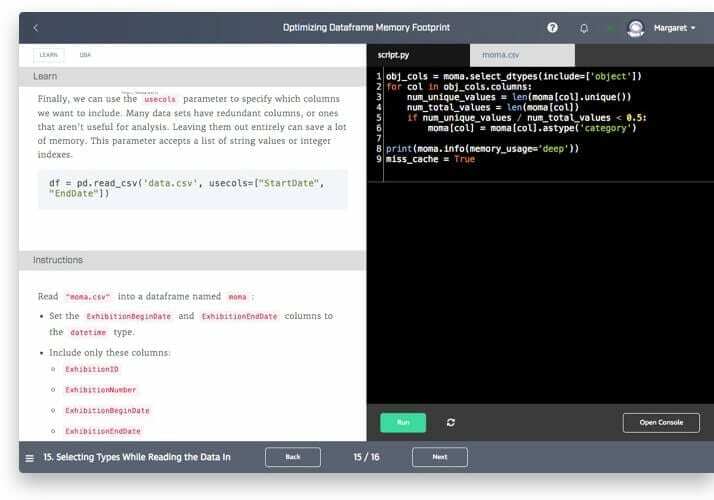 Learn Python, R, SQL, data visualization, data analysis, and machine learning. Try any of our 60 free missions now and start your data science journey. You'll learn data science by writing code, working with data, building projects and interacting with your peers. On Dataquest, you'll be writing code and working with real-life data sets from your browser. We’ll check your code, give you hints along the way, and support you as you learn. Our interactive in-browser coding experience will help you make progress fast. We’ll guide you through building real data science projects that’ll help you showcase your skills for future employers. You’ll get to interact with peers who will inspire and motivate you. Trade ideas for your next project or get help in your job search. "Dataquest helped me develop my data analyst skills, I credit the guided projects with getting me the job I have today." Choose a guided career path or pick from 38 individual data analytics courses to sharpen your skills. We'll teach you the skills you need to start your career in data science.